Note the settings we are running versus you with 1024x768 and no FSAA. are we going to establish a testing standard? not everyone has 1920x1080 monitors. i have 1680x1050, and i bet most are below that. we should just stick to what the stock settings are. ? ? Ye sorry Didnt see that. Nvm will run the test again later. Stock would be best. 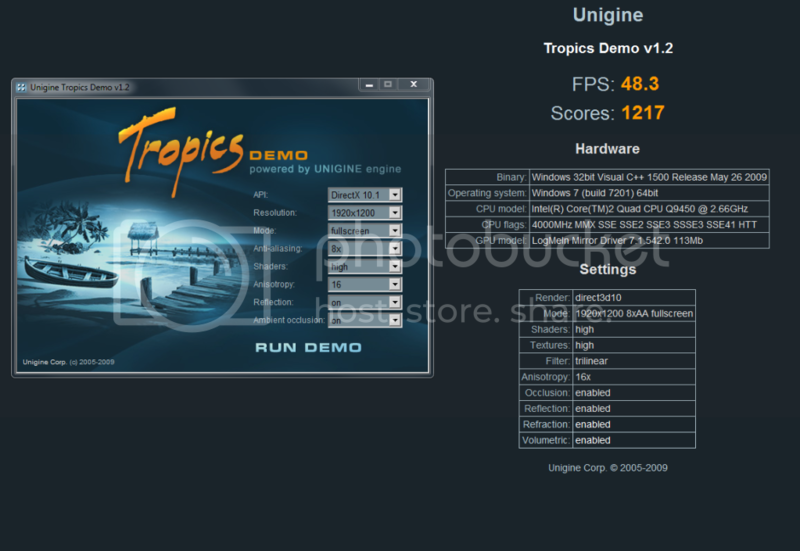 If you can't run 1280x1024...well...yeah. I think i'll rerun it at stock settings to actually get some benefit out of my clockspeeds It's not cool being over a full ghz faster on the CPU and only like .8fps faster on the bench . Hmmm...now that I'm thinking about it, I wonder how DX11 programs like this will scale passed 2 gpus since it looks so GPU limited at high resolutions??? Anyone got a 4870X2 they'd part with for around 200USD? . LOL much better! . GPU is still stock with no overclocks. 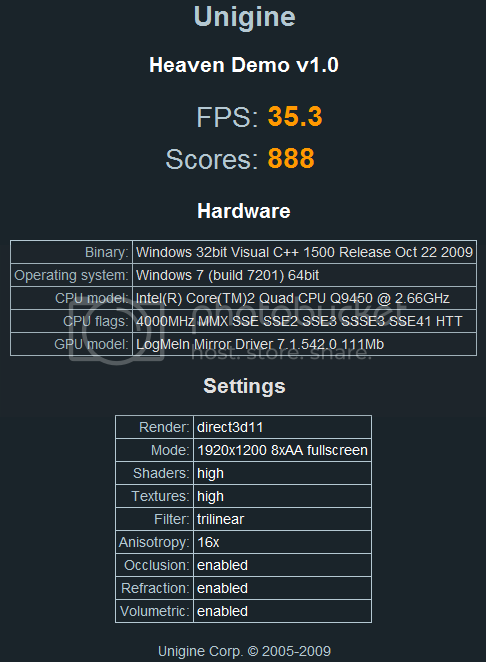 Haven't you guys noticed that this benchmark only does the GPU & not the CPU lOl...so you can stop over clocking your procs to infinity and beyond cause it wont affect your scores very much. When I run this my proc (avg of 4 cores) is only using 19%. I wanted to post my score but it seems some are doing dx9 some 10 and some 11....sooo it dont seem very standardized, OP should state what settings must be used for certain benchmarks. Not that impressed with my 5970!!! 8XAA and 16XAF with all settings on high and you aren't satisfied? Its a Black edition and it says it should do some silly speeds but this is the max.